Whether he becomes president-elect or president of Trump TV still remains to be seen, but love him or hate him, everyone has an opinion on presidential candidate Donald J. Trump. It only makes sense then that the subject of politics and the upcoming election might come up over coffee or in that moment between the trailers and the movie starting. While almost half of millennials are experiencing voter apathy as Election Day approaches, their opinions – and the opinions of other Americans – are that there are types of dating situations they’d much rather be in than dating a Trump supporter. We surveyed 2,000 people in the United States to understand what is better, or worse, than dating someone stumping for Trump. Continue reading to see what we found. Sixty percent of survey takers would rather be alone for four years than date a Trump supporter. This would certainly afford them time to learn a new hobby, pursue additional education and certifications, and get into the best shape of their lives before dating during Trump’s re-election campaign. What’s worse than being a Trump supporter? Being a serial cheater. Eighty percent of respondents would rather date a “Make America Great Again” lover than a cheater. Similarly, most were opposed to dating a slob over a Trump supporter. Less than 30 percent would go for the slob – they might think that it’s easier to change someone’s political views than altering personal habits. Almost 50 percent of women would date someone old enough to be their dad, while less than 30 percent of men would date someone old enough to be their mom rather than a Trump supporter. Where were men more willing to look the other way? Ex-pornstars. Close to 65 percent of men would date an ex-adult film actress over a Trump fan. Just over 50 percent of women said they would pick the same trade-off. Depending on your age, there are concessions you may or may not be willing to make in order to avoid dating a Trump supporter and having awkward conversations about walls, insurance premiums, and Supreme Court justice nominees. For instance, Gen Xers are more likely to date a serial cheater over a Trump supporter. You can apparently forgive discretions, but not the deportation of undocumented immigrants. Baby boomers would rather date someone with a contagious skin disease or a cousin over someone who supports Trump. Maybe they’re just tired of hearing conspiracy theories about email servers for the 33,000th time. Millennials would rather take almost any other pathway than date a Trump supporter. They don’t care if you smoke, live with your parents, are 30 years older, or unattractive – nothing is more ugly than a walled-off political ideology to these voters. It turns out, most of our survey respondents would rather date some of the most unfavorable characters out there than a Trump supporter. But why wait until you’re four or five dates in to learn your date dons the red hat? By using Sapio, available on the App Store and Google’s Play Store, you can answer detailed questions that will help you find someone with the same beliefs. Make dating great again by downloading it for free today. 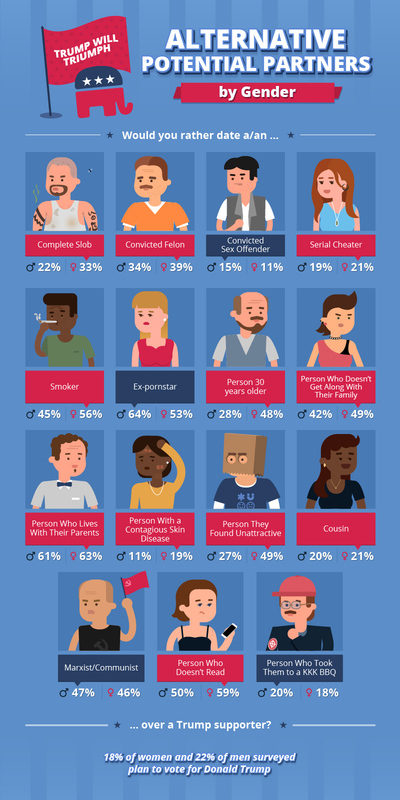 We surveyed over 2,000 people in the United States about the type of people they would rather date than a Trump supporter. Want to share this content with your reader? Be able to claim that no one has more respect for this project than you by linking them back to this page.